oh my father christmas. can i come hang out at your house? i think i will. Love the old pic of you guys - just look at petey's sweet mug! And Shirley is looking mighty fine! Where did you find those felt snowflakes? 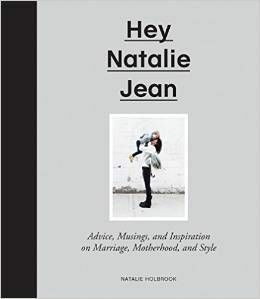 If you made them, I'll need you to share the how-to, please! i'll be getting my tree a bit later (last time i jumped the gun, got a tree, it died right away, and december was fillllllled to the brim with pine needles everywhere), but i'll send her along one day. i love real trees, i love shirley, and isn't your new apartment just unreal?! so big and spacious! My first time commenting after lurking for a full year (!) but Shirley is too lovely not to comment on!! I have moved my tree plans from the 10th Dec (I am British, we do our trees later) to this coming weekend. We live in California and the American Christmas Kick-off has been too hard to resist!!!! But Shirley is a thing of beauty. Nice work!!! She's a pretty girl that Shirley! The doilies behind her are might cute too! Gah! I just clicked to see your first fake Christmas tree, and Brandon IS TinTin! He's even wearing the same outfit! Ha! love it! I always go cheap on ornaments too. $40 - not bad! 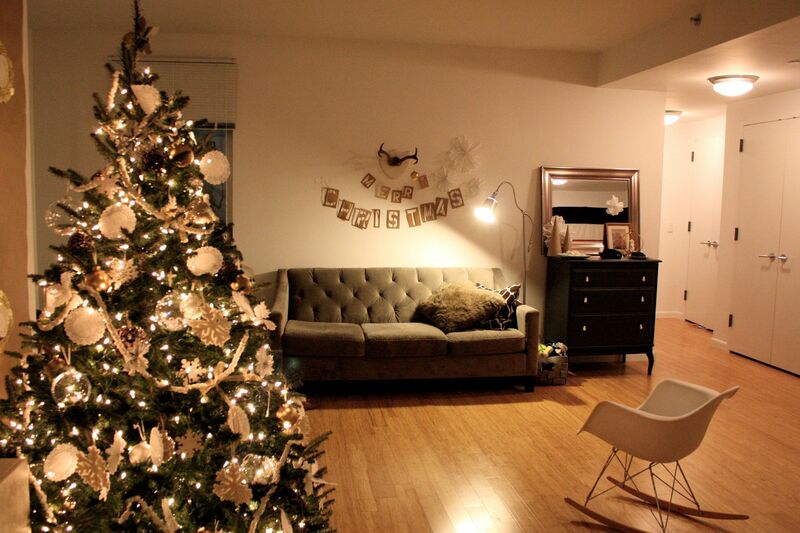 Love your tree and new apartment, it's gorgeous! I'm getting my tree this weekend, hope it's not too late to send in my picture! i love the garland. i've always wanted to make something out of those, but never knew what to do. oh, and in that picture of your first fake tree, brandon looks just like tintin! i think i would've thought that even if you didn't put the image in my head the other day. 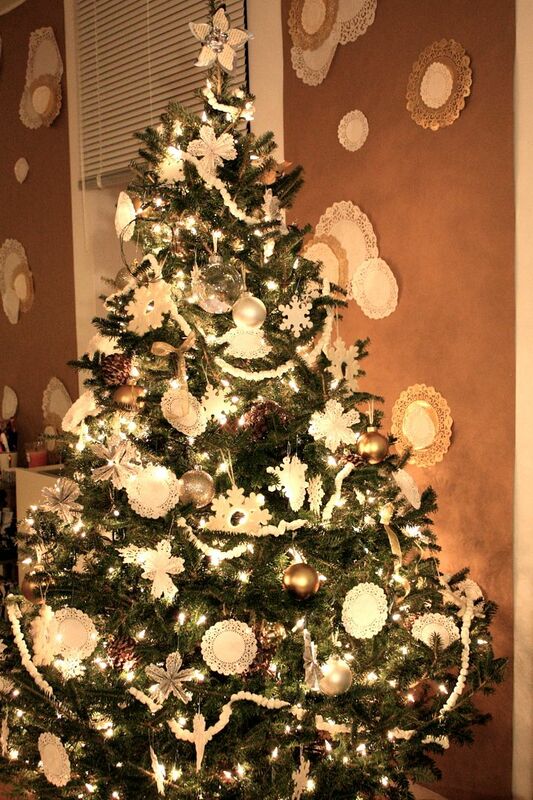 What a great idea for the Christmas tree posts! I can't wait to see them. So pretty! Love your tree. 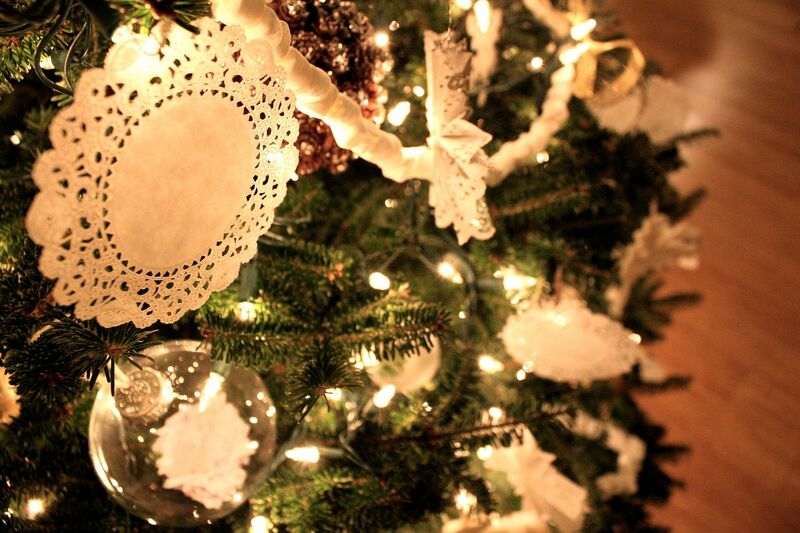 I love the tree and all of the doilies everywhere! 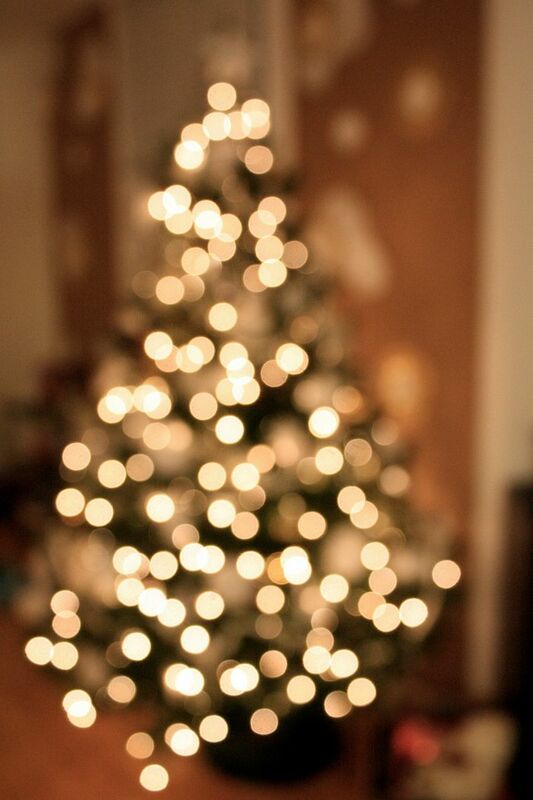 Makes me want to go home and snuggle up in front of a Christmas movie with our own Christmas tree all lit up! Out of curiosity, how many ornaments has Huck removed already? 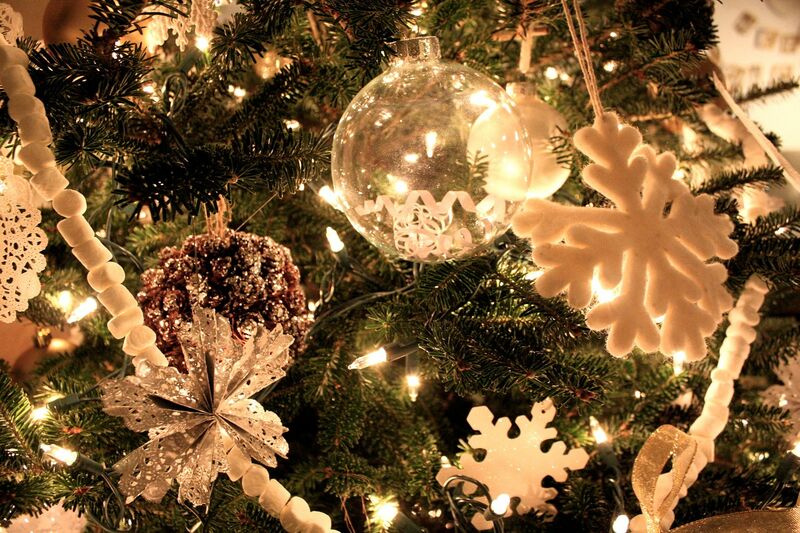 Every evening post-kiddie-bedtime, I replace about ten ornaments (found tucked away in curious little corners of the house) only to discover the same ornaments missing by 10:00 the next morning! What a mystery. My tree is a scrawny little plastic thing I got for my own room when I was 12--it's been scaled by cats so many times over the years that it's looking a bit peaky. Jim can hardly accept that a born-and-raised Oregonian uses a PLASTIC tree rather than buying fresh, but I'm poor, so there you go! We're rocking a blue-and-silver theme this year, though after seeing Shirley in all her glory, I think I might need to add a few more doilies! Oh, and I love your apartment in all its shiny newness. Gorgeous. great post .... and i think what i love the most about it is seeing all your ROOM after your tiny little last space! 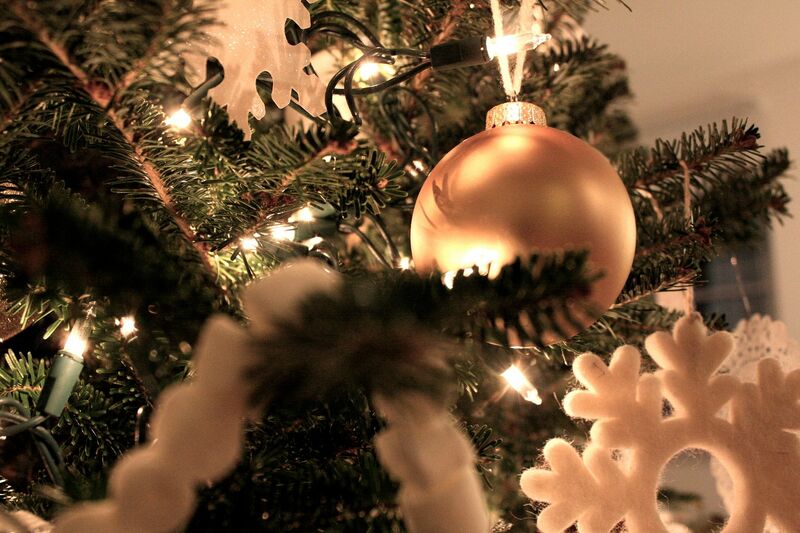 your tree looks fantastic. i am the same way about arranging, rearranging, moving, tweeking, admiring ... ahhhhh, a total spiritual affair indeed!!! I'll have you know after reading your blog throughout the past year (like all of it) your white plastic tree gave me enough courage to buy my own! We needed a smaller tree this year because of our new smaller living room and our green fake tree was far too wide. So white I went! It's fantastic. Oh, and Shirley is very festive indeed. Oh, she's beautiful!! Looks so classy! are those marshmallows? what a splendid idea! Shirley is marvelous. I just know she would fall in love with Octavious (our tree)...he's a little crochety but we love him. Wayyyy off topic, which I don't mean to do because Shirley is quite glorious; but, please, please tell me where your couch is from! Doilies...duh. That's adorable and so affordable! here's what I wonder. Does Huck baby want to hug Shirley and pull himself up amongst her branches? Does he want to 'taste' the ornaments? Or perhaps he admires from afar?